Little Common Football Club threatened to pull off a cup upset before eventually being well beaten last night (Tuesday). Common took a second half lead against a Worthing side which plays two levels higher up the non-league pyramid only to concede six times during the closing 40 minutes in a 6-1 defeat. The Parafix Sussex Senior Challenge Cup quarter-final was delayed by 10 minutes after one of the floodlights went out before Common kicked-off with the benefit of a blustery wind. Common goalkeeper Matt Cruttwell dived low to his right to keep out Callum Overton’s header and then pushed over Zack Newton’s header either side of a Lloyd Dawes shot flashing just wide. Rebels went close again on 23 minutes when Overton’s cross was miscued by a Common defender and Harvey Sparks’ shot from eight yards was brilliantly saved by Cruttwell. The visitors’ goalkeeper dived high to his left to keep out Dawes’ shot from 18 yards before Cruttwell kept out two efforts from Corey Heath in quick succession. Worthing’s Ryan Quirke blasted over from 20 yards, while at the other end, Rebels goalkeeper Jack Fagan was out quickly to claim the ball at the feet of Lewis Hole. Cruttwell denied Dawes when he got through on goal and Dawes again went close in the final minute of the first half when he drove an effort just wide of the far post. The Dawes versus Cruttwell show continued in the second period when Rebels’ striker stung the hands of the visiting goalkeeper 90 seconds after the break. Sparks fizzed a shot just wide before Common went ahead on 51 minutes. Martin Denny beat the offside trap as he raced on to a throughball and coolly fired under Fagan for his second goal in as many matches. 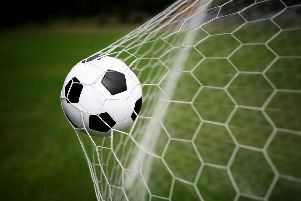 It took Rebels just four minutes to equalise as Cruttwell was unable to hold Dawes’ fierce free kick and Worthing captain Steve Metcalf pounced to score from close range. Within a minute, Worthing were ahead as Newton broke down the right and passed the ball inside to Metcalf, who took a touch before firing past Cruttwell from 15 yards. Will Hendon’s shot from four yards was pushed wide by Cruttwell and Dawes saw two more efforts kept out by Cruttwell, who also denied Overton inbetween. Dawes should have got on the scoresheet on 71 minutes, but Cruttwell thwarted him. Will Hendon flashed an effort just over before Dawes finally got on the scoresheet after 79 minutes when he coolly dinked the ball over Cruttwell from 12 yards. With Common tiring, Dawes got his second just a minute later when he beat the offside trap from Newton’s throughball and chipped home from 12 yards. Dawes completed his hat-trick from the penalty spot on 85 minutes after Newton was tripped. He then got his fourth from Jack Barnes’ cross in injury time to put a slightly flattering gloss on the final score against a hard-working Common side. Common: Cruttwell, Sherwood, Mote, Eldridge (Robb 87), Morris, Trickett, Denny (Lusted 72), Brown, Hole, Crone, Lusted. Subs not used: Foster, Curteis, Wells, Sloat.